Fixed a bug where agents would not move when dropping of pieces. Intersections of trails now get the maximum value of their neighbors. Intersections can only occur when a pheromone has three or more neighbors. Neighbors only exist orthogonally. 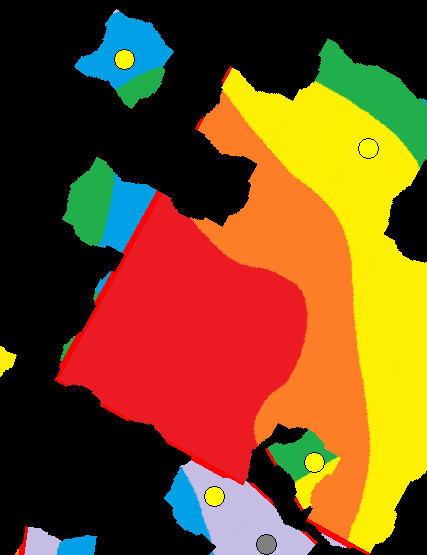 The x and y position for each pheromone is now computed correctly internally. This entry was posted in Uncategorized on March 3, 2015 by EricMustee. With non-random trail leaving enabled (it is by default), agents will no longer leave trails for longer than they were holding their pieces. Instead of having n different images for each n-sized puzzle, there is one image for each puzzle. Piece images are created from the image processor. This cut down on file size (~4MB to < 500 kb) and makes importing the project much easier. The program attempts to load a “masterInput.json” file in the current directory and on the desktop automatically, so it is no longer necessary to use the command line to load input files. If no file is available, the default image/agent selection screen appears. The masterInput.json file is available in the zip above. Agents no longer wonder off screen while leaving trails due to the reverse movement array being initialized with the wrong size. This entry was posted in HASS on February 22, 2015 by EricMustee. On average, it took 567.7788ns to retrieve the hash for the (rather large) file loaded in using the BufferedReader. This is very quick Now, consider the way hashcode’s are computed for strings. Ultimately, the hashcode is computed as a large sum of overflowing integers as seen above when Path A is taken. We can get very precise control over the string’s hash value by manipulating the last seven characters of the string. Let’s see how the String, “Bobby Likes ApplesNAS3d1Q” was computed exactly anyway. // this is pretty quick anyway. // hashing function evaluate to zero. // Increases the character at i until the hashcode is negative or zero. // Increases the character at i until the hashcode is positive or zero. The above is the hashing function expressed mathematically. However, since it overflows, all we have to do is effectively make the number divisible by (the maximum integer value * 2 + 2), or 4294967296. Doing that is easy since the manipulating the last 7 c values gets us the precision we need to effectively make the value equal to zero without having to introduce any strange characters. Also, since the value is a sum, we can pre-compute the hash code for the first n-7 values, and simply manipulate the characters in the last 7 values. The algorithm kind of reminds me of opening a combination lock: we manipulate each character until the hash code changes its sign or becomes zero. Each character we manipulate gets us more precision and thus closer to the hash code being zero. Now, let’s take the saved Wikipedia article, run the process on it, and see how long it takes to hash. We can take the article variable we bench marked before, and simply re-assign it. According to my computer, the time it now took to get the hash code for the string was 158755.78ns. This is over 250 times slower! By adding just seven ordinary characters to the end of the string (they were “ODP5`/]” by the way), we made the average compute time much slower. How can this be fixed? We can get much better performance in these bizarre cases by simply adding a boolean that represents whether the value has been hashed yet or not, rather than checking if the internal hash is zero. This code is run so frequently, it surprises me that there are even two separate variables (h and hash) in the hashCode() method to begin with. By replacing one of the integers (h) with a boolean hasBeenHashed, we can save a lot of time in these bizarre circumstances. This entry was posted in Programming on February 19, 2015 by EricMustee. Many of us set our clocks forward so that we are on time. This makes us think that we are going to be late, but end up pleasantly surprised when we get to wherever we are going to on time. Or so it goes until you get used to the fact that your clock is five minutes fast. In the end, you can accurately predict the time. This clock is NOT broken! There are a few advantages of this randomized clock I can think of over a fast regular clock: it forces you to prepare for the worst. This is a clock you simply cannot get used to. Say you have lived with this clock for a month. If you have access to no other clocks, you would have to pretend that the time is always fast, otherwise you could miss out on some opportunity. However, you may occasionally be pleasantly surprised when you find you not only have arrived on time, but you have arrived early! 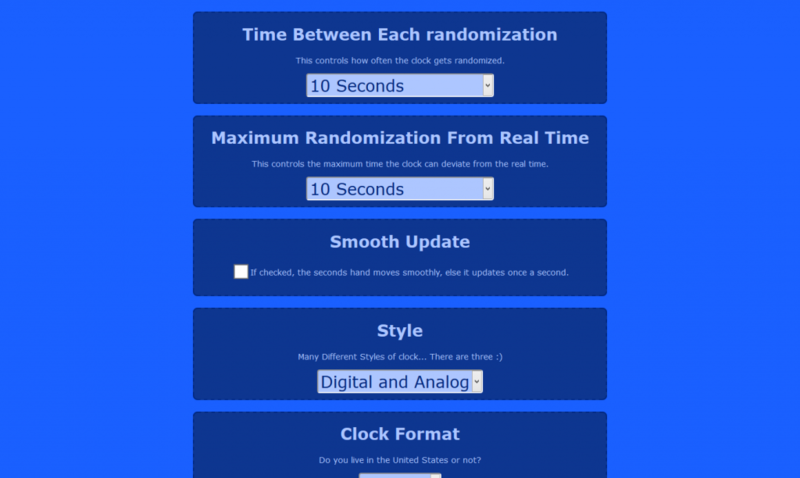 This is what makes a clock like this neat: if you pretend a randomized clock is always fast, you will at worst never be late, and you will sometimes be early. Following this type of clock in this way is a bit of a commitment however. Any color of your choice! In order to do this, I took it upon myself to look into the HTML5 canvas and cookies. I’ve been wanting to play with these for a while, and I enjoyed them. I quickly hacked together the clock/settings page in two afternoons, and I am pretty impressed with the simplicity and flexibility behind the canvas element. Is this a better solution than just setting your clock faster? Who knows, it might be. If you are strict about following it, it probably is better. For what I gather,this is either a terrible idea or a great idea based on the type of person that uses it. In any case, it’s better than the broken clock this is going to replace in my living room, as this clock is likely to be close to correct more than twice a day. This entry was posted in Strange Ideas on February 16, 2015 by EricMustee. Here are the list of changes (with screenshots). The source/executable can be found here, along with a new input file. For simplicities sake, only two are currently implemented (curvy and triangular edge shapes). Done dynamically: To update edge shapes, simply place new shape images in jar. Disable with “fancyEdgeShapes”: false in input file. The old style random trails may be used by using “randomTrails”: true in the input file. Can be used to slow simulation. For extra cinematic effects, turn the FPS to 24 (if you dare…). By default, trails now get reset to the initial time limit when an agent leaves a trail over an already existing trail. This prevents a checkerboard pattern that was common after trails decayed. The old behavior can be retrieved by using “resetTrailToInitial”: false in the input file. This entry was posted in HASS on February 14, 2015 by EricMustee. Emergent: A Card Game By Daniel Palmer, Now With Networking Support? Emergent is a card game created by my advisor, Dr. Daniel Palmer. 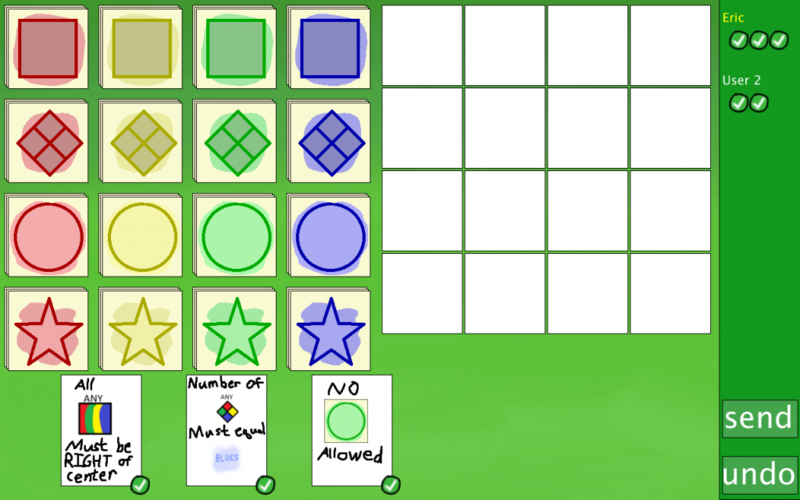 It consists of players placing colored shapes on a board while maintaining certain constraints. The game is cooperative, meaning that you must work together as a team in order to win. It has been blogged about before by Dr. David King here, where he explains the game and his thoughts and feelings. In this post, I will talk about the work I put into digitizing the game. There are two separate areas on the screen above: the card supply on the left, and the playing field on the right. Players move cards from the supply to the field when playing. Above, we have two players playing in separate sessions perhaps across separate devices. 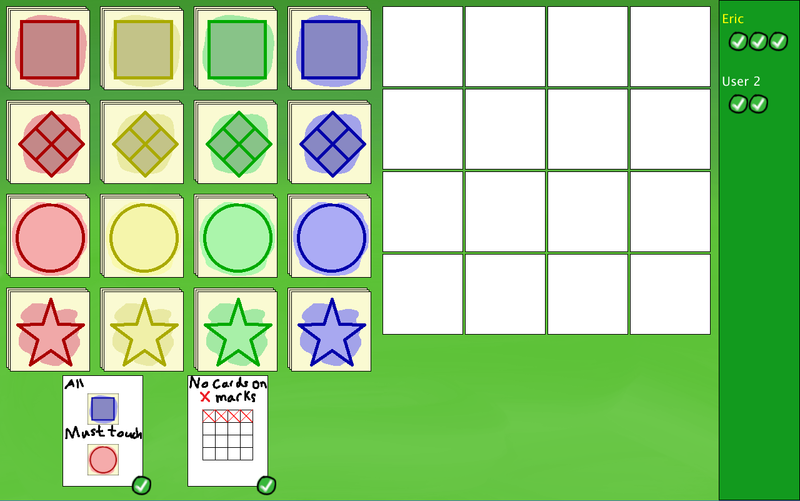 Eric has three constraints: all squares have to be to the right of the center, the number of diamonds has to equal the number of blue shapes on the board, and there cannot be ANY green spheres at all. User 2 has two constraints: all the blue squares must touch a red circle (and vice versa), and there cannot be any cards in the top row. In order to win, both 12 cards must be placed on the board and all user’s constraints must be satisfied. When pieces are removed, they are gone forever, so it is very possible and likely that players will lose. The card game (the non-digital implementation) seems very balanced so far, and takes a good amount of thought to complete. Because of the lack of communication, players form emergent behavior on how to place pieces not unlike how behaviors emerge in swarms. This is where the name gets its name from. Throughout the past few weeks, I have been working on/off on digitizing the game to make it playable across the Internet. This is an interesting game to digitize because there are a lot of things that may happen in a game that are hard to keep track of. A digital version of the game would allow for more gameplay, and less setting and organizing all the pieces. The first stage will involve creating a simple graphical Java application that can connect to a central server and play a game with others. This stage is already well under progress. The next step may consist of game created with Unity that will allow players to play against each other on a variety of platforms, including mobile devices. Like I said, the digital version of the game I am working on still needs more work, and there will be progress updates as a part of my blog. The card game is ready for prime time, and there should be a Kickstarter by Dr. Daniel Palmer sometime this year in which I will be supporting. 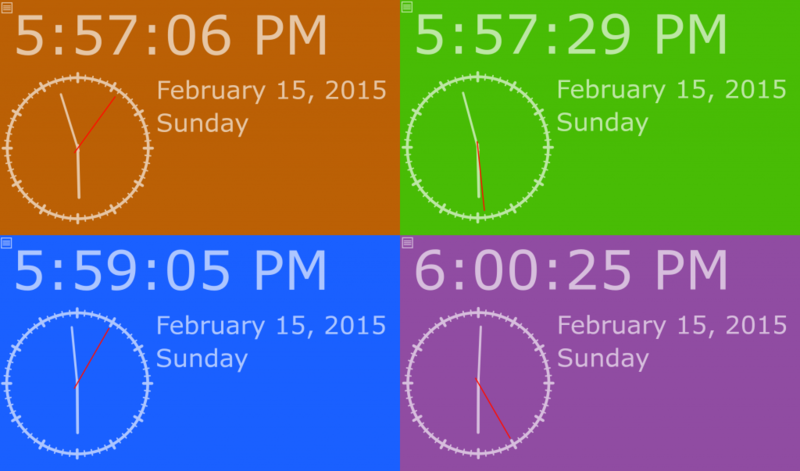 This entry was posted in Emergent on February 2, 2015 by EricMustee. To import it into eclipse, go to File > Import > General > Existing Files Into Workspace. Browse for the archive file, and you are ready to go. This entry was posted in HASS on January 29, 2015 by EricMustee. Hello, this is a test post for a new blog. It might contain my thoughts in the future, or it might just be a collection of random things I do with my time, or some mixture of both. We will see. This entry was posted in Personal on January 29, 2015 by EricMustee.